The Connecticut Lakes are a group of lakes in Coos County, northern New Hampshire, United States, situated along the headwaters of the Connecticut River. They are accessed via the northernmost segment of U.S. Route 3, between the village of Pittsburg and the Canada port of entry south of Chartierville, Quebec. The lakes are located within the boundaries of Pittsburg, but are far from the town center. Connecticut Lakes State Forest adjoins them. 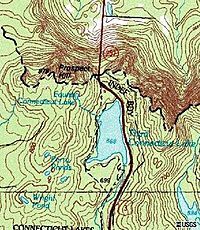 There are four lakes: First, Second, Third and Fourth Connecticut Lake, numerically running south to north. First Connecticut Lake is the largest. Fourth is the smallest, northernmost, and the source of the Connecticut River. The only access to this lake is via the Fourth Connecticut Lake Trail, which goes in and out of Canada. All lakes are north of the 45th parallel. First Connecticut Lake is located in the town of Pittsburg, 5 miles (8 km) northeast of the village center. At 3,071 acres (1,243 ha), it is the eighth-largest lake located entirely in New Hampshire. 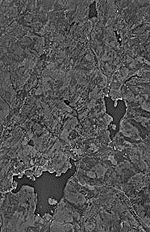 It is the lowest (and largest) of the chain of lakes near the headwaters of the Connecticut River. Fish species include landlocked salmon and lake trout. 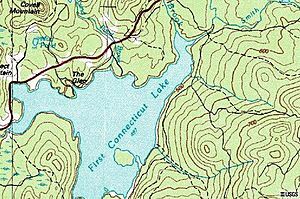 Second Connecticut Lake is an 1,102-acre (4 km2) water body in the town of Pittsburg, situated 2 miles (3 km) upstream from First Connecticut Lake. Fish species include brook trout, landlocked salmon, and lake trout. Third Connecticut Lake is a 231-acre (93 ha) water body in the town of Pittsburg, situated 5 miles (8 km) upstream from Second Connecticut Lake and less than 1 mile (1.6 km) south of the Canada–United States border. The lake is the third in a chain of lakes marking the headwaters of the Connecticut River. It is approximately 100 feet (30 m) deep at its deepest part. Fish species include rainbow trout and lake trout. The Fourth Connecticut Lake is the northernmost, smallest and most remote of the Connecticut Lakes in New Hampshire. It is the source of the Connecticut River, situated 0.5 miles (0.80 km) upstream from and 482 feet (147 m) higher than Third Connecticut Lake. 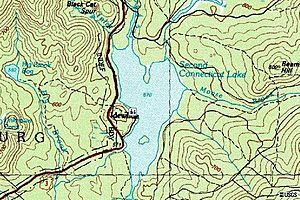 The Fourth Connecticut Lake Trail, which criss-crosses the international border between the United States and Canada, leads hikers to the lake. The land surrounding the lake is owned by The Nature Conservancy. The Fourth Lake is immediately to the northwest of the third lake. The 25,000 acres (10,000 ha) surrounding the lakes was set aside as a land conservation project in 2002 by the New Hampshire Fish and Game Department. The protected area is within the towns of Clarksville and Pittsburg, up to the border with Canada. Connecticut Lakes Facts for Kids. Kiddle Encyclopedia.